In the exotic city of Marrakesh an assortment of individuals gather to hear the words of a master storyteller as they spin into a tale of epic proportions. It is a story of love, yearning, loss and ultimately a mystery. Hassan usually delights his listeners with tales of the imagination; however, on this night he chooses a reality-based story that is quickly taking on mythological proportions. It is the unraveling of the fate of two foreigners who, enchanted by the art, music, and the essence of the city, were lured into its very center on one unforgettable night. The Jemaa is not only the location of the group constructing the retelling of that crimson night, but also the setting of the story itself. The Jemaa is the center of all. People of every background visit the square to experience the sights, sounds, and sensations that are Marrakesh. Two such individuals once arrived at that place, and their story haunts the people to this day. Hassan does not create fiction on this night, instead choosing to try and piece together the truth about the couple’s disappearance in order to absolve his brother Mustafa of the crime. As he tells his tale, readers find themselves adrift in his childhood, other distinct—and seemingly insignificant—memories, and even a prediction of what might lie in the future. The foreign woman, Lucia, is one of myth. Her grace and beauty lured the men of Marrakesh to remember her even in their dreams; she haunts the Jemaa to this day with her mystery. The slender man is a silent companion in some recollections, only a vague memory to most. What really happened on this night of nights? Many recall their meetings, conversations or short glimpses of the pair but no two tales are the same. How is one to know which is truth and which is merely the musings of an overactive imagination? How much can one truly rely on a memory even if it is one’s very own? The very definition of reality, truth, and memory all combine in this mystical reconstruction of one life-changing event. The conglomeration of multiple viewpoints along with Hassan’s artful narration, makes readers feel as though they are along on a quest for truth in a sea of conjecture. One can hear the drums, smell the spices, and taste the fragrant tea while traveling to another world with the author, who writes as if from another time. 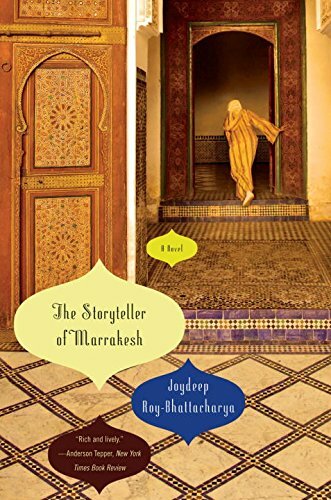 If a story is a dance, The Storyteller of Marrakesh is one of poetic grace, taking the reader on an adevnture where the ending is not of primary significance because the joy lies in the journey itself.